Hello Warriors! and happy summer to all of you. Because the spring semester has ended, our student bloggers will be taking a break over the summer. 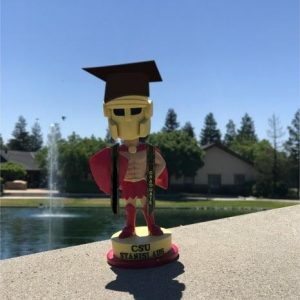 Some of our bloggers will be returning for the fall semester and some of our bloggers will end their blogging session at Stan State this semester. Check out our bloggers last spring semester blog! End of the School Year 2017: Kaylee blogs about her last semester and how it flew by for her. She will be taking a blogging break during the summer, and continue blogging during the fall. Last Post of the Academic Year: In this blog post Tamara blogs about how she is going to graduate, and how she cannot believe that she has finished her fifth year at Stan State. She also shares pictures of her adorable cat in her blog post. Farewell, Readers: This is Luis’s farewell post, because he has graduated from Stan State. In his last post he shares his accomplishments he achieved while blogging, he thanks all the people who supported him, and congratulates everyone graduating this year. Congratulations Luis!! Happy Summer: Sara is glad she is finally finished with finals and is excited summer has finally started! She shares the activities she plans on doing during the summer, and how she cannot wait for her hometown festival, the Apricot Fiesta. She will be back in the fall to share how her summer went! It’s Summer Time: Margie shares how she will be taking a blogging break during the summer, and how she will return during the fall. She shares what her plans are during the summer, and how she looks forward to what she is going to be doing all summer long. Thanks you readers for checking out our blog posts! Hope to see you again during the fall. Have a great summer Warriors! !